In 11 days, little ghosts and goblins will be haunting the streets, gliding figures silhouetted in the glow of streetlamps. Front porches will be festooned with gauzy spectres and sneering jack-o-lanterns attracting tiny trick-or-treaters, and some young-at-heart ones as well. Up to the door they will come, baskets and bags in hand, in search of sugary sweets. Until then though, the excitement of the upcoming occasion will have children full of chatter and energy. For moms at home, or educators in classrooms, finding activities to entertain and occupy the mind goes a long way toward filling the days and making the wait until Halloween tolerable. In keeping with the spirit of the ghoulish holiday, there are many fun projects and crafts to be found on the internet that will help active little minds and hands keep busy. 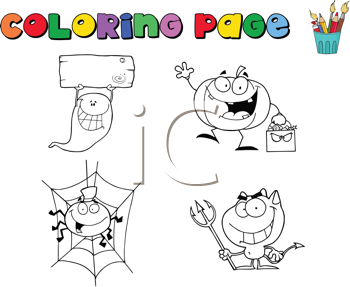 As well, a subscription to an online graphics service can provide an endless supply of colouring pages with themes for Halloween, as well as many other child-preferred celebrations throughout the year. This collection from Clipart.com has wonderful variety with something for everyone from baby scribblers to the more experienced young artists, while these adorable illustration from iCLIPART.com also add a different element to the fun giving tots to option to use the handy tool that lets them colour the illustrations right on the website. And all of them are in the 'spirit' of Halloween fun.